Saturday- The TV weather forecasters were saying that we were in a major, late winter, snow storm. So we paid for another night at the casino, staying put until the storm passed. San Felipe is between ABQ and Santa Fe, and is in a small valley between the mountains. Both ABQ and Santa Fe had snow, although the roads were clear in ABQ. We had rain, flurries and sleet. At 9:30, we decided to drive to ABQ. We went to a Verizon store in a mall. The guy could not have cared less! No phones there either. There was a Best Buy Mobile store in the mall. This is not a Best Buy, it is just a cellular store. The gal, Taylor, was awesome! She set us up with the new phones, Galaxy S7’s, obtained a better rate than at the Verizon store, put on our covers and screen savers. She was fantastic! We will not go to a Verizon store again! As we were leaving, friends Tom and Debbie Abernethy contacted us. We made plans to meet for dinner. We returned home, at lunch, and worked on getting our new phones set up. 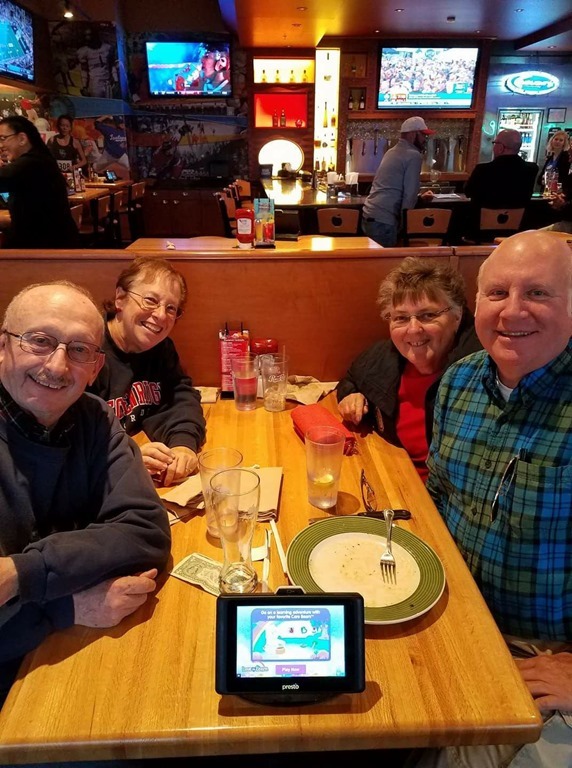 We left at 5:30 and drove to Applebee’s for dinner with Tom and Debbie. Sunday- We left to travel north at around 9AM after making sure that the truckers were on the road. We saw snow on the side of the road through Santa Fe and up in the mountains. Then it cleared out. We were worried about Raton pass, but we sailed over it. The temperature gage on did not even move. Looks like that problem is solved. We continued on and arrived at the KOA north of Pueblo. We do not like to stay at KOA’s as they are too expensive, but that was all that was available. We settled in at the park and rushed to do a lot of laundry. We completed it all and left most of the clothes to dry overnight. Monday- Bob goes to disconnect the water hose and finds that someone had stolen our cap. An odd thing to steal, as it only costs a couple of dollars. Fortunately Bob had another one. This is on the drinking water hose and we try to be careful of the end. We did not like getting in and out of this park. We had to go through a single lane tunnel under the interstate that was 13’3” tall. We are 13” tall, so it was scary. We continued north on I-25 until our usual turn off in Castle Rock. We use that route to go around Denver. We arrived at the Elks Lodge at about 12. Julie was out with Noel for brunch, so we backed into the 50 amp site on the wall to wait for her to arrive to tell us where she wanted us to park. We ate lunch while waiting. Julie arrived at about 12:30 and directed us to one of the new 50 amp sites on the hill. We backed in and set up. Once that was completed we ran to the car wash.
We ran through the car wash as the car was a mess after being towed behind the MH. While we were vacuuming the inside, we noticed that someone had run into the passenger side rear light. We think it must have been a pick up truck as it is high up. The color was black, as we can see the paint that was left. So Bob is ordering new lights online. We went to social hour at 4 and had wings for dinner $6 for a dozen,, which we split. We had a quiet evening at home. Tuesday- We woke up and did some tasks around the MH. We left at 10 to go to Bob’s Cardiologist appt. We checked in and they took us in right away. The gal did an EKG and everything looked fine. We met with Dr. Finta, and decided that Bob is going to have another Ablation. UGH, hopefully it will go better than last year! This is different, as they are going to do a different procedure.. I have to look it up! This procedure is to take between 5-6 hours. We returned to the MH and I ran to the Lodge. I was having lunch and playing Ponytail Canasta with the girls. We had a nice time, ending about 4:30. Then Bob and I sat with Jay and Elaine to chat until 5:15. We returned home to cook dinner and feed the dogs. We settled in for a quiet evening. Wednesday- It has been rainy and bone chilling cold due to the humidity. Windy also! I worked on my next article to up date. We waited for the Direct TV guy to arrive. He showed up around 8:30. He found that our problem was the wiring from the satellite to the DVR box. That is our issue, not theirs. We have been noticing that the shows would break up and it kept getting more frequent. Yesterday the shows just stopped for 30 seconds, then would break up and start back up. The guy thought adjusting would help, but it did not. So Bob slowly started working on replacing the wire. He has to go slow to not set off the Afib. He sets an alarm for 10 minutes, then stops and sits for 10 minutes, then works another 10 minutes. I had my Mammogram at 3 PM , out west, as I could not get an appointment at the closer facilities. We ended up staying for awhile, since I asked for a CD of the previous mammograms so that I can take them to Arizona. Bob went with me and we stopped at Walmart on the way back. We had a quiet evening and ate dinner at home. Thursday- I finished one of the articles and sent it off. That is 2 down and only 1 to go. I started on the third, which is a 2 credit article, so it is going to take me a little longer. I also am working on the Roadrunner newsletter. At 12 we left to go to my Orthopedic appointment. I had a good report there and do not have to return until 2020. He was please with my knees and my 40 lb. weight loss! We stopped at the storage unit to pick up some photos and I am sorting and going to send them off to be digitalized. We returned to the MH, walked the dogs, and left to go to Bob’s Retinal specialist. He had a good report from that! Normal eyes! We returned and went to social hour. This was outside today, as the temp was 79 degrees and sunny. We stayed until 5:30 when we returned , ate dinner and watched TV. I continued sorting pictures and Bob finished some of the TV wiring. We put items back into the cabinet. Friday- We had the dogs Vet appointment this morning. We thought the dogs were due for the Leptospirosis shot, but the dogs were not due. So we ordered meds for them and moved on…. Bob continued to work on getting the new cords to the TV and he was able to get that completed. I worked on photos and scrap books. We had brought those back from the storage unit and I have been going through the boxes. More to come! We ate lunch and I went for a manicure. Then more photos and scrapbooks. At 4 we went to happy hour. Mel and Thelma were passing around this Tequila. 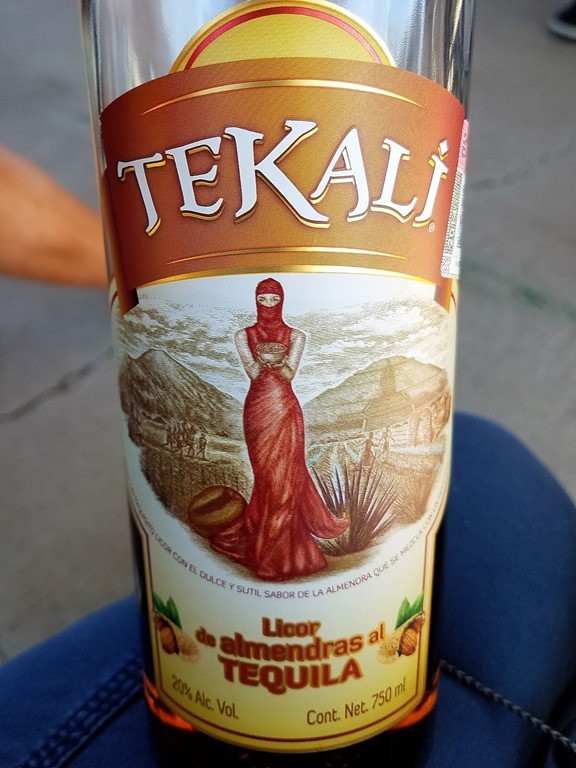 Neither of us are Tequila drinkers, but this was really good! It had an almond flavor. The passed our tiny cups and we each tasted a bit. It is available in Mexico for $7.99 and here for $20. You can only bring one bottle, each, back over the border, so they buy each time they go to Mexico. They stay in Yuma, so it is easy to go back and forth. We went to dinner at the Lodge, having Taco Salads. Neither of us ate the shell, just the salad.